ACTA was rejected by European Parliament on July 4th, 2012. 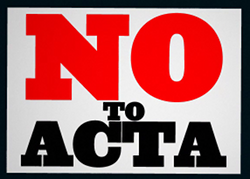 As citizens we must urge our representatives to reject ACTA. Which countries already signed ACTA? October 2011: Japan and United States, who crafted the treaty, together with Canada, Australia, New Zealand, Singapore and South Korea. January 2012: European Commission, in charge of negotiations, together with non elected representatives from 22 Member States: Austria, Belgium, Bulgaria, Czech republic, Denmark,Finland, France, Greece, Hungary, Ireland, Italy, Latvia, Lithuania, Slovenia, Luxemburg, Malta, Poland, Portugal, Rumania, Spain, Sweden and United Kingdom. The signature of ACTA by European countries does not mean the deal is done, needs to be ratified by the European Parliament. They will vote no later than june 2012 to either ratify or reject ACTA. Please read more how to act and call your MEPs, tell them to vote against ratification. Read the Counter-arguments vs ACTA to help you debunk the EU Commission's lies about ACTA, which are also relayed by pro-ACTA members of the EU Parliament. Get the fact-sheet in PDF. - EDRI´s: What´s wrong with ACTA? Since Spring 2007, 39 countries (27 member states of the European Union, the United States, Japan, Canada, South Korea, Australia, México as well as a few other countries) negotiated in secret a trade agreement aimed at enforcing copyright and tackling counterfeited goods: ACTA. Leaked documents show that one of the major goal of the treaty is to force signatory countries into implementing anti file-sharing policies under the form of strong criminal sanctions. ACTA is one more offensive against the sharing of culture on the Internet negotiated by a small "club" of like-minded countries. Negotiated instead of being democratically debated, ACTA bypasses parliaments and international organizations to dictate a repressive logic dictated by the entertainment industries. At a time when important debates are taking place on the need to adapt copyright to the digital age, this treaty would bypass democratic processes in order to enforce a fundamentally irrelevant regulatory regime. It would profoundly alter the very nature of the Internet as we know it by by putting legal and monetary pressure on Internet service providers (in a most subtler way than in previous versions of the text), ACTA will give the music and movie industries a legal weapon to force ISPs to police their networks and users themselves. Please read the final analysis of the text signed by non elected representatives and why we need to defeat it together. - Call Your MEPS. --> Be nice. - Tweet your MEPS. --->OFC, be nice and don´t spam. - Visit stoppacta.protest.info --->For specific info about demos. *Contact your elected representatives to inform them about ACTA, and advise them to oppose this circumvention of their powers and competency. *Contact journalists and bloggers and ask them to write and research about it. *Blog about ACTA, link to websites talking about it and analyse its content. *Ask that their report on ACTA recommend the Parliament to reject it and tell them about the dangers of ACTA: Who to contact. - MEP Kader Arif Blog: "I will not take part in this masquerade"
"That is why today, as I release this report for which I was in charge, I want to send a strong signal and alert the public opinion about this unacceptable situation. I will not take part in this masquerade.” *Kader Arif, ex-ACTA Negotiator of the European Parliament. “A trade agenda that limits the legitimate movement of cheap generic medicines will hit the poorest people in developing countries unfairly hard.” - Rohit Malpani, OXFAM - press release on the potential impact of ACTA. "The EU should reject ACTA in its current form – implementing the agreement could open a Pandora's box of potential human rights violations." - Widney Brown, Senior Director of International Law and Policy at Amnesty International urging the European Union to reject ACTA. "Intellectual property must be protected, but it should not be placed above individuals' rights to privacy and data protection." - Peter Hustinx, European Data Protection Supervisor (EDPS), issued a report on ACTA, claiming that it could prove unworkable under current European Union data protection laws. Copy and paste in the header of your website, tumblr, blog, etc..